No Need to Be Nervous or Scared!! Find Laser Dentistry Near You TODAY!! Since the early 1990s, dentists the world over have used lasers to help treat oral and dental issues. Thanks to its minimally invasive nature, using dental lasershas gained popularity among those who need fast and effective dental treatment. Are you looking to find laser dentistry near you? In this article, we go into detail about the various treatment options available to you, the inherent risks and benefits of opting for laser treatment, and where to find laser dentistry clinics in your area. Dental care should be a top priority in everyone’s life. That is why you shouldn’t make a decision about seeking laser dental treatment unless you first understand what it is and what benefits it offers. To help you get a grasp of the basics, we put together a quick guide to laser dentistry. In the 1990s, the U.S. Food and Drug Administration (FDA) first approved the use of lasers for treatment on the gums of humans. A few years later, the FDA ruled that lasers are in the clear for use on teeth and oral bones. Since then, laser dentistry has sprouted into a multi-million-dollar practice that attracts patients from around the world. Qualified dentists use diode lasers, carbon dioxide lasers, and YAG lasers to perform non-invasive surgeries. In most cases, these lasers operate between 900 and 1,000 nm wavelengths. When at the right wavelength, dental laser beams can burn through soft and hard tissue, without the need for sedatives or anesthesia. ​Although lasers were once in limited use in dentist offices, they are now used to treat a laundry list of dental and oral ailments. Most commonly, laser dentistry is used to treat tooth decay and gum disease or to perform teeth whitening or lesion removals. Biopsies are also commonplace in laser dentistry since tissue can be lasered off and then checked for tumor growth. However, that’s not all that laser dentistry lesions are good for. For example, they can be used to lesion canker sores and other sores and deformities in the mouth. 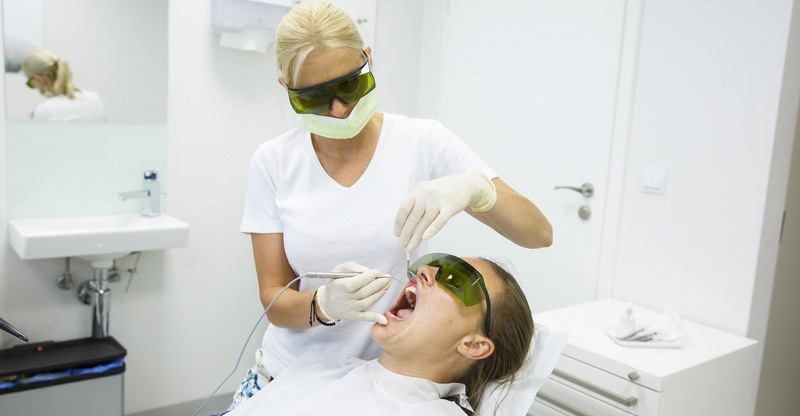 ​Whether medical or cosmetic, there are plenty of uses for laser dentistry. Although the cost of the procedure was once prohibitively high, the cost of receiving laser dental treatment lowers every year. In the United States, some laser dental procedures cost as little as $4,000 and are eligible for insurance coverage. Over the past 25 years, laser dentistry has become a widespread alternative to many dental treatments that were once only treated with invasive surgery. The following applications are the most common when it comes to laser dentistry in adults. In short, yes, laser dentistry has been proven time and again that it is a safe alternative to conventional, invasive therapy options. In a published statement by the American Dental Association (ADA), the use of lasers in dental surgery was officially endorsed and noted as being safe for a variety of treatments and therapies. However, as the ADA points out, it is imperative that all dentists who use laser instruments in their surgeries receive proper training and certified approved by the ADA and the FDA. Before receiving laser dentistry treatment, always check to make sure your dentist has certification which proves the extent of their training. According to the Academy of Laser Dentistry, it is necessary for every dentist and clinician who uses lasers for non-surgical management of periodontal disease to receive basic proficiency certification from the American National Standards Institute (ANSI). This certification ensures that the dentist knows how to safely operate the technology and is compliant with the law. Years of practice has determined that laser dentistry is indeed safe for children and minors. 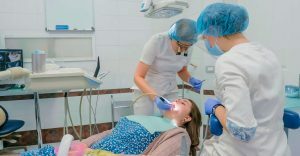 In fact, they can be safer than traditional forms of dental surgery that require needles, drills, and other potentially scary devices that can intimidate children or cause panic. Forms of pediatric dentistry often performed with a laser are dental fillings, pulp removal, and frenectomies. If you live in the United States, you should have no problem finding a dental clinic that offers laser treatment. For a fast, easy-to-use directory of clinics offering laser dentistry in the US, we recommend using the Emergency Dentists database. They offer free information about dental clinics across the country, state by state. When disaster strikes, we need to seek out emergency dentistry for immediate care. Sometimes even basic dental issues such as toothaches and oral soreness can be an indication of a serious problem is left untreated. If you might have an oral infection or a potentially grave dental issue at hand, contact Emergency Dentist’s toll-free number right away at 1 (888) 420-6826. The professionals at Emergency Dentists have helped thousands receive the treatment they need no matter the time of day or year. Their 24-hour staff is on hand to help you find urgent dental care near you, including laser dentistry and non-invasive surgeries. There are dozens of dental clinics in the State of California that offer laser dentistry services. From Los Angeles to San Diego, San Francisco, Fresno, or Sacramento, you are bound to find a laser dentistry clinic near you. Visit this California Emergency Dentist database to find a clinic near you. From Manhattan to Rochester, there are countless dental clinics in the New York that offer laser dentistry treatments. To find a clinic near you, visit the New York Emergency Dentist database. There are plenty of dental clinics in Texas that provide emergency laser dentistry. Whether you live in Houston, Dallas, Arlington, or El Paso, you are sure to find a clinic nearby. Check out the Texas Emergency Dentist database to find a provider near you. If you live in the American Midwest, you have plenty of options when it comes to finding a dental clinic that offers laser dentistry. Visit the Michigan Emergency Dentist database to find a clinic near you, whether you live in Detroit, Grand Rapids, or anywhere in between.